Box grown trees are common in most areas of the country, yet rarely used by northern growers. We have decided to “step out of the box” by growing trees in boxes, as opposed to round plastic containers. 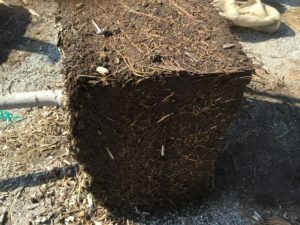 Our design allows for the development of an improved root system over the traditional field grown or container grown trees and lessens the carbon footprint of traditional tree production. For shipping, the trees are removed from the boxes and placed in a custom designed and sewn, square burlap bag. The boxes are then used for the next crop of trees. For our shrubs and smaller trees, we continue to move away from the traditional round plastic containers. Plastic containers are a “one use, then out” item and clog our landfills. We are slowly replacing the plastic containers with Root Pouch Pots. These fabric containers are made from recycled materials and are biodegradable. They also help produce a superior root system, allowing for better drainage, and they also serve as a physical barrier to Jumping Worms. Our Fruit Trees of History collection was started in 2001, when we began growing Johnny Appleseed Apple Trees from grafts provided by American Forest’s Famous and Historic Tree Program. Since that program ended a few years ago, we have been grafting and growing these important trees under an agreement with the Johnny Appleseed Museum and Education Center*, located in Urbana, OH. Each Johnny Appleseed tree sold, will be registered with the Johnny Appleseed Museum and Education Center. Once registered, you will receive a certificate of authenticity, verifying your tree as being genetically identical to the last verifiable tree planted by John Chapman, aka. Johnny Appleseed. Our Sir Isaac Newton Apple trees (the true varietal name is “Flower of Kent”) are grown from grafts taken from a tree, located on the University of Wisconsin campus in Madison, WI. With lots of help, we were able to trace this special tree back to Woolsthorpe Manor in the UK, home of Sir Isaac Newton. There is no certification available at this time. Touch these trees and you touch the past. Taste the fruit of these trees and enjoy the flavor of history. 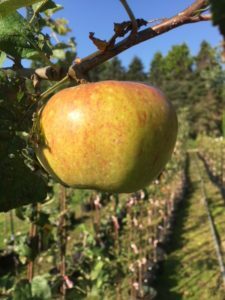 We proudly offer Johnny Appleseed and Sir Isaac Newton Apple Trees through our garden center and online sales. Both these trees are grafted on Malling 7, semi-dwarf rootstocks.